How to Creat Your Own Free Website ? Home TUTORIALS How to Creat Your Own Free Website ? Website is most important way to make money online and social marketting. 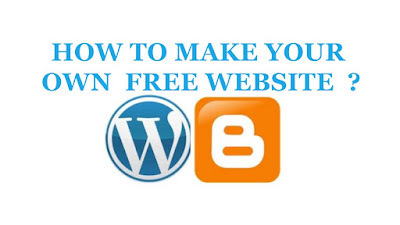 There are 2 easiest way to make Free Website in Nepal. That's Blogger and Wordpress. is the famous and suitable For Beginner Publisher . Blogger Platform is hosted by Google and Wordpress is hosted by Wordpress. And it can be hosted on payed diffrent hosting. these both of the site platform you can link your custom domain by purchasing on domain provider. other wise your free site domain name will like this sample "yourname.blogspot.com " & "yourname.wordpress.com. you can change your domain name custom as you wish. whcih platform best for you ? 1, Blogger platform has few design & functio features. blogger has a few low quality looks . But good feature of blogger is its completly free hosting with unlimited bandwith. Blogger does not support any thirdparty plugins its has drag and drop layout. but more easy to add your custome domain name by purchasing thirdparty any site . you can edit and modify theme but its limited on advance. There are many blogger free theme but you can not remove footer credit on free theme. you can buy premium design theme from devloper and sales site its very cheap. Blogger very easy to use to write post anytime . it will can access your admin pannel by your gmail id. you can give many people admin acess on blogger . its completly free to use by google accpeting google policy. 2, WordPress Blog Platform needs more knodledge regarding give great looks , feature & maintain . its fully customazable. wordpress platform site looks like very profestional. in this case if you want to link custome domain. you need to pay $13 yearly. You need to buy hosting also to control and store your website data for profestional. if you have no idia to web desgin no worry to make profestional website . you can also buy profestional theme design by site but its you need to pay more cost than blogger theme for wordpress theme. in the nepal wordpress hosting pakage and visiter suitable are limited. wordpress support verities of wp plugins. it will handle over many plugins. artical looks like high quality hd. there is some features different with wordpress.com and wordpress.org . you can not moneytize you site developed using wordpress.com . if you are going to use business propose. wordpress.org platform best for you. These Both platform you can use in nepal . If You are small publsiher we suggest you to use blogger platform because its completly free & easy user interface.